Never before have I been SO excited about something coming out of the oven. I thought the days were long gone where I hovered by the oven, peeking through the partially frosted glass, trying to see what was going on inside. But the first time I made this candied bacon I was so nervous that it just wasn’t going to work. Could sugar and bacon really be a delicious combination?! Would the sugar get hot enough that it would set firm once the bacon had cooled down?! Would you all think I was crazy for even attempting a recipe that seems to have divided people across the UK and US?! I guess we are about to find out. I use it as a bit of an excuse, but one of my favourite things about food blogging is that I get to think about Christmas even earlier than most. Did you see my recipe for a Festive Baked Camembert a fortnight ago? I did wonder whether it was a teeny bit early to post Christmas recipes but if I’m thinking about Christmas I figured you would be too! Right now my focus is on recipes that make good appetisers or party food. The kind of things you can serve up to guests along with a glass of mulled wine or a cranberry gin and tonic while “All I want for Christmas” by Maria Carey is blaring in the background. This recipe for Cinnamon Candied Bacon is perfect for that. The crisp shards of bacon can easily be held, and nibbled on, with just one hand. (The other hand being kept free for your cranberry G&T of course). 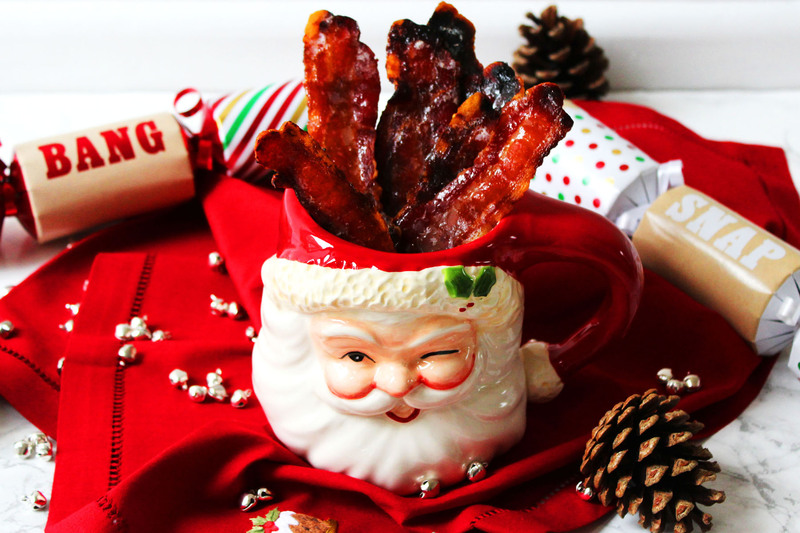 It’s probably no secret (or surprise) that the first recipes for candied bacon came from the US. Americans are famous for taking perfectly good foods and covering them in chocolate, sugar, sprinkles and other unnecessarily sweet flavours for seemingly no good reason. With that in mind I was a little apprehensive about making candied bacon and I wondered if it was one of those American food fads that just wouldn’t take off over here. But you know what? I was pleasantly surprised! If you’ve ever had an American style breakfast involving pancakes, eggs, bacon and maple syrup (and enjoyed it) then you will LOVE cinnamon candied bacon. It takes all the best things about that breakfast and turns them into a fun snack! To make this recipe even more festive, I’ve added cinnamon and a pinch of nutmeg to the brown sugar mix along with a little black pepper to spice things up a bit. I don’t know about you but cinnamon instantly makes me think of Christmas! So how do you make candied bacon? And what’s the science behind it? Well…first you take streaky bacon (not normal back bacon like we’d usually buy in the UK) and you dip it in a mix of brown sugar, cinnamon, nutmeg and black pepper. Once it’s well coated you lay it on a grilling rack in your oven (with a sheet of tinfoil on the rack below to catch any drips – I forgot this step the first time I made it and boy do I regret it now.) You then bake it in the oven low and slow. The sugar and spices will melt together and caramelise as the bacon cooks. After letting the bacon cool you are left with a crisp sweet yet salty snack! Mix the light brown sugar, cinnamon, nutmeg and black pepper and place on a plate. Take a slice of streaky bacon and brush with a little maple syrup. Lay the bacon on a grilling rack which has been placed over a tray covered in tin foil. Repeat this process for each bacon slice. Cook the bacon at 150C for 25 minutes or until the sugar has caramelised and the bacon cooked through. Leave the bacon to cool and harden on the grilling rack. If we manage to get the house straight in time we are planning on having a few people over for a glass or two of mulled wine at some point in the run up to Christmas. 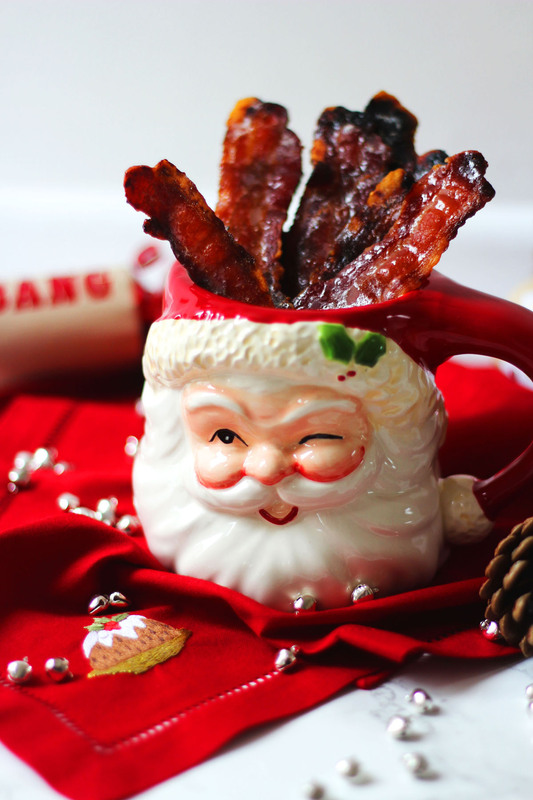 As well as serving festive blinis and marzipan mince pies I’ll definitely be serving this cinnamon candied bacon! The sweet and salty combination is incredibly moreish. Who knew sweet meat could be so tasty! Are you having any Christmas get-together-s this year? Do you usually put on just a few small appetisers or do a full on festive buffet? Now I know you have fallen in love with that cheeky Santa mug…if you want to decorate your table much like the table you see in the photos then check out these links below. Don’t worry, none of the links are affiliate links. I don’t get a penny if you click through! Oh that sounds so good. I could easily crunch my way through a batch with a drink before dinner! Thanks Helen. It certainly is dangerously moreish!!! I loooove candied bacon, and this one has such lovely flavours in the mix! Your santa pot is cute! Love the idea of candied bacon with cinnamon, sounds like something I would really enjoy snacking on!